In celebration of Robert DeVoe’s painting career we have gathered a body of work from galleries and personal archives and are proud to host this exhibition at Hanson Howard Gallery to close out the 2017 season along with our traditional Gallery Artists’ Salon. Join us in a reception for the artists on First Friday, December 1st, 5-8 p.m. Exhibition runs November 24- December 30th. 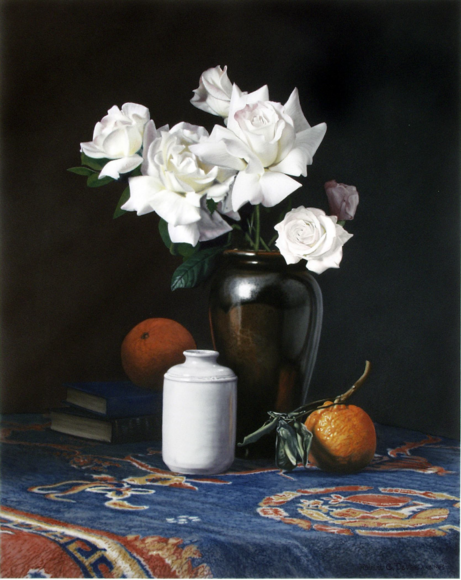 Robert C. DeVoe, master Realist Painter began his career as an artist with Hanson Howard Gallery in the early 1980’s and was soon receiving recognition and awards in national exhibitions. An English Professor for 20 years at SOU, he retired early to become a full time artist. He has been included in major exhibitions and collections across the country throughout his long and successful career. His painting of our local mountain range was chosen for the cover of The Artist and the American Landscape, a book sold in museum book stores. He is most noted for his extraordinary still life paintings. His use of color, light and texture embodies the finest attributes of the Realist Painting genre. In the classical tradition, they represent life with authenticity.